I've got water in the rear passenger side floor of my 2002 Ford Mustang convertible. There is no other water, anywhere else, just where you put your feet. No leakage anywhere else that i have seen. Especially when the car has been parked for a few days and it's soaked in there. Any ideas? Drain tubes? Anyone else had this problem? Thx for the help in advance. Leaks in the back of a 2002 Mustang convertible is quite common. 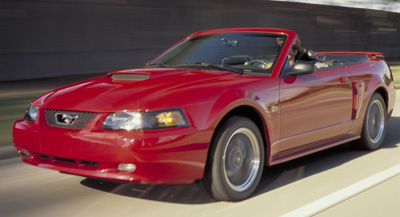 In fact it's very common for all 1994 to 2004 convertible Ford Mustangs. Rear leaks tend to come from wear and cracks near the back of the window in the fabric,causing it to pool up and drain into the floor wells. Also seals around the rear quarter windows become more common as the car begins to age. Rather than go over the same information again, I think you'll find what you need in this post about the same problem on a 2001 Mustang convertible leak. In that response I've outlined where exactly to check on these Ford Mustang convertible tops, as well as more on the weatherstripping. The good news, is that all of these convertible top leaks are pretty easy to find and inexpensive to repair.